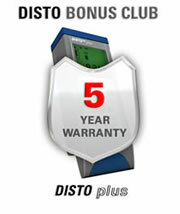 LaserStreet.com - Leica DISTO Plus Laser Meter – DISTO Bonus Club 3 Year Extended Warranty. Buy Here! Extension of the DISTO plus 2 year manufacturer warranty to 5 years. This warranty is not transferable between units and does not cover the physical loss of covered unit. This warranty will not apply to any failure, defect or damage caused by improper handling, use, maintenance or care. Damage to the unit resulting from battery corrosion is also not covered by the warranty. Copyright © 2005-2006 LaserStreet.com All Rights Reserved.